Extraordinary as one word means “beyond what is ordinary or normal”. It describes something that is unusual, not found in everyday life, or what you would expect. An extraordinary thing in nature is a small seedling eventually growing into a giant redwood over thousands of years – and then being chopped down and processed into the paper that contains the manuscript for an Oscar winning film. An extraordinary thing is talking about your favorite college football team beating their hated rival with about five seconds to go and with the lead, seeing this as a monumental upset, when all of a sudden the punter fumbles the ball and the other team picks it up and takes it in for a score. An extraordinary thing is an unknown singer going on a singing competition show, auditioning and making it through, surviving all the rounds, winning the whole thing, and launching a star studded career that is still going strong – all because he or she walked through a door one bright day. 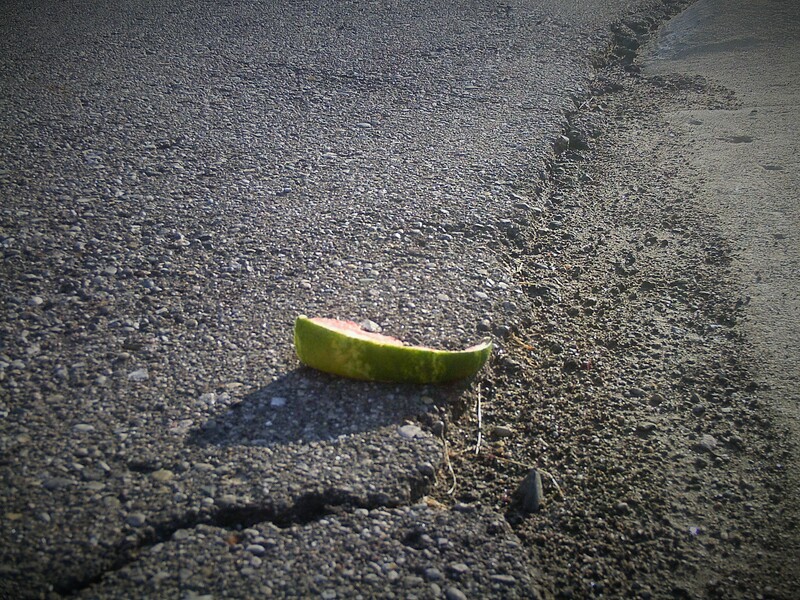 In terms of something being extra or more ordinary and uninspiring, this watermelon rind that I found lying in the road could not be any less mundane or unassuming. It was obviously thrown to the ground after someone was finished eating the juicy red “meat” while taking a leisurely stroll. It must have been interesting enough for me to snap a photo of it though, but it is worthless garbage that is long gone now and will never be anything special. Was once an extraordinary whole watermelon, now reduced to a single rind. I loved the simplicity and symbolism of this image so much that I had to use it today. True story. But it makes for a provocative image. The leading line of the crack in the road makes the shot. I know. It is a thought worthy shot and I’m glad I had the knowledge to look at something differently. Minimalism is what I thought about while taking this picture. Thanks for your perspective.